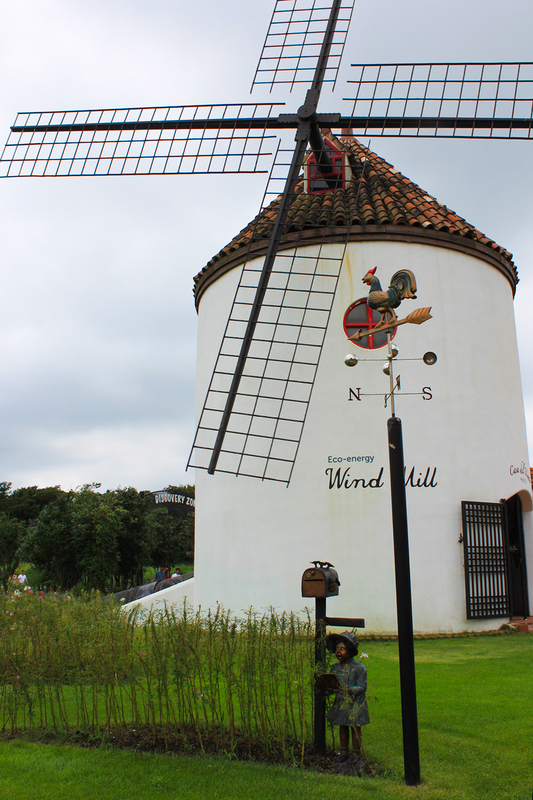 Want to see less famous places in Jeju? These places are for you who love nature, less crowded areas and want to take amazing photos. 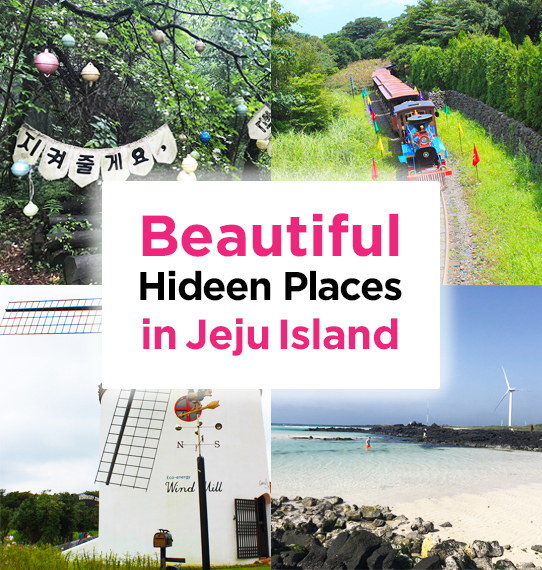 You can pick a few places you want to visit and easily make a custom Jeju tour here by writing your requests in the special request box. 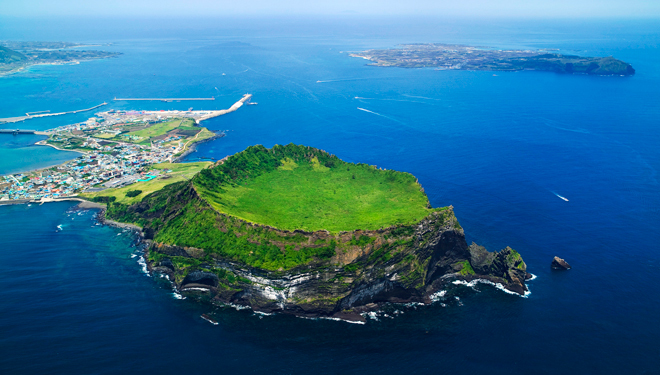 Want to read about the famous places in Jeju island? 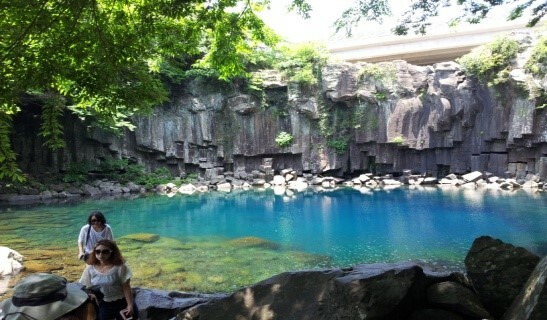 Exploring the West and East side of Jeju Island! 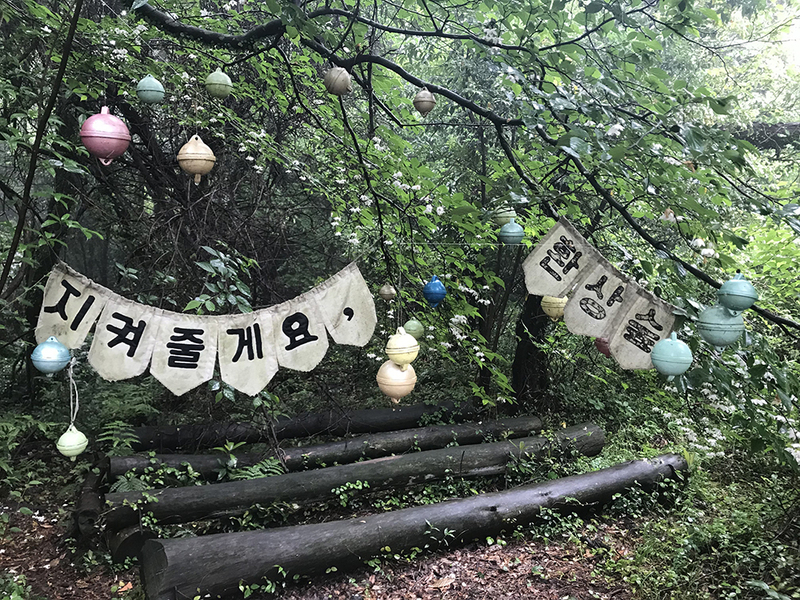 The Hwansang Forest is a beautiful private forest with a small entrance fee. We recommend going in the morning for a calm, mystic feeling. The best time to visit is during the spring or summer. 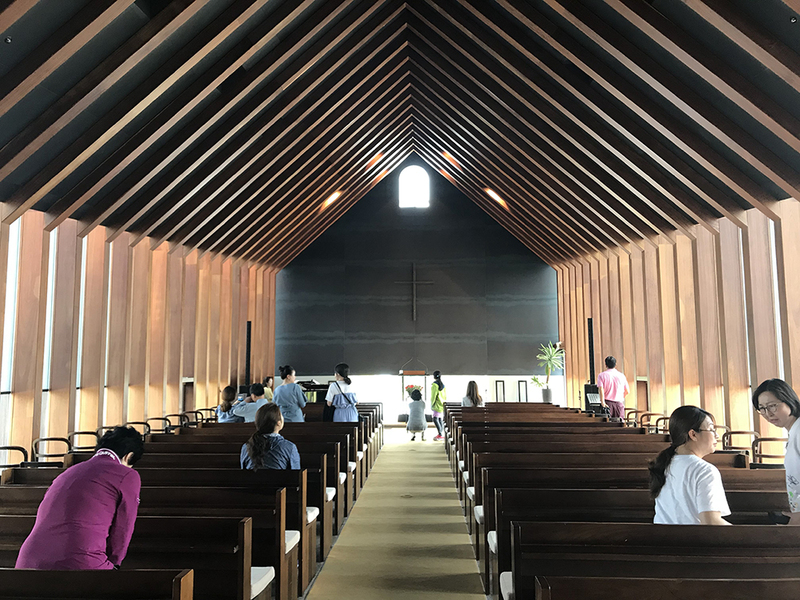 This stunning church is a great work by the famous Japanese architect Jun Itami. It’s a real church open to the public except at church service hours. The location it stands on also gives you a beautiful view of the island. For people who love design and architect, this is a must stop by! Yongmeori Beach is a place where Sanbangsan Mountain stretches into the ocean and it looks as if a dragon’s head is going underwater. 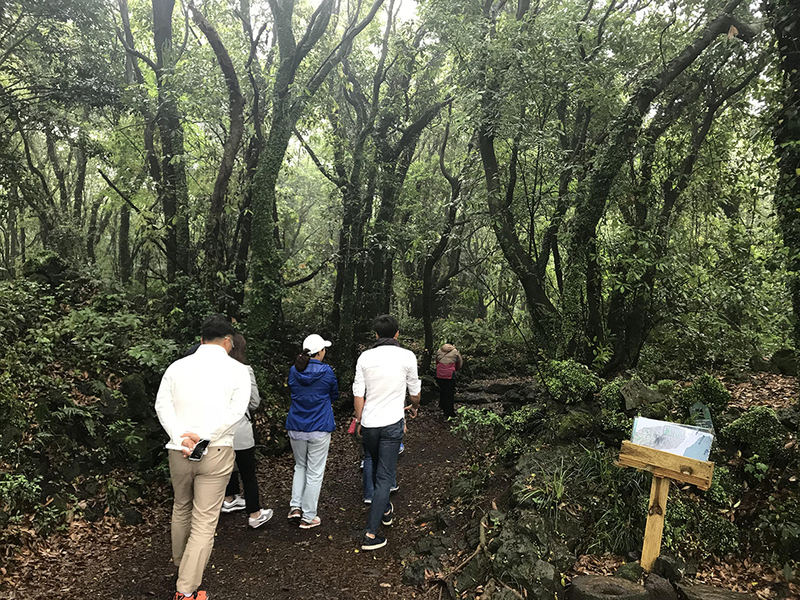 It’s a great trekking course with a view of the sea. The cliffs have unique formations which may interest photographers. 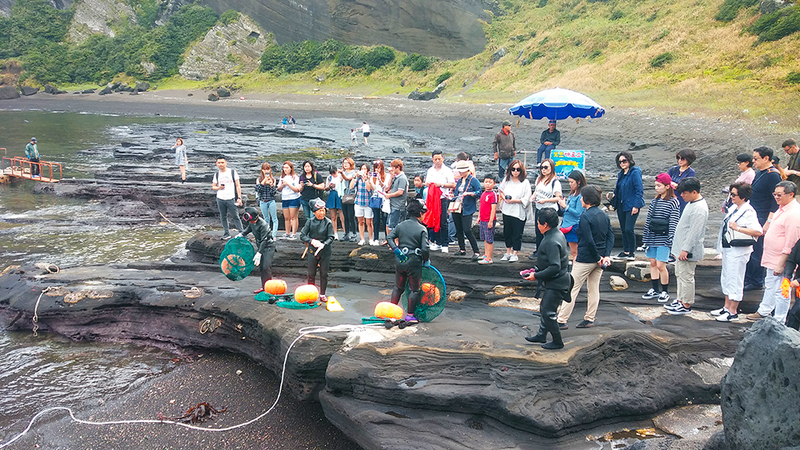 And you may also be able to spot the famous women sea-divers of Jeju who sell sea cucumbers and stroll on the road along the seashore. 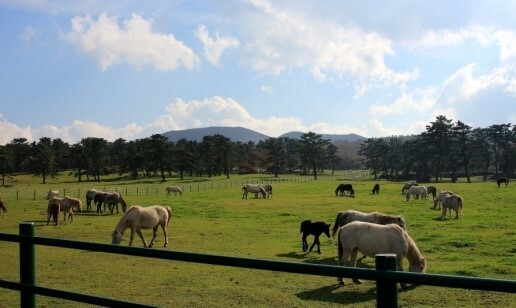 To see the Yeongmori beach and Sanbangsan Mountain there may be a small entrance fee. It may not be a famous beach but it has a beautiful scenery of cobalt-blue clear waters, white clean sand, and black volcanic lava stones. Great photo place and popular with fishermen who enjoy rope fishing from the rocks! Saryeoni Forest Trail is quite popular among tourists who enjoy hiking and nature. 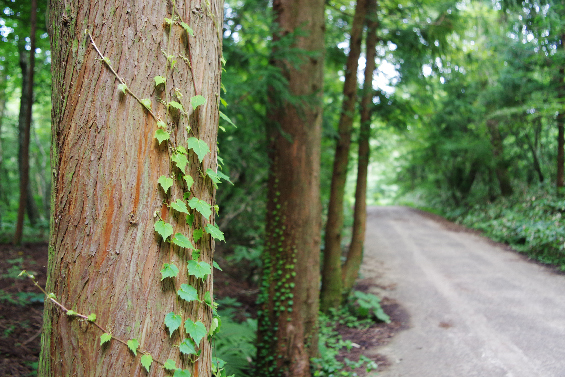 The majority of the trees growing here are Japanese cedar. 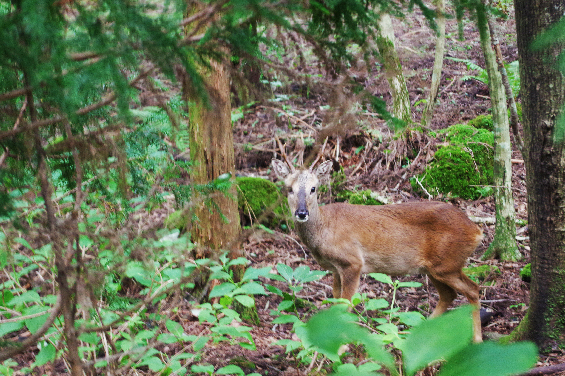 The forest trail is well-protected and is definitely a place to recommend for people who want to hike and take lovely photos. To get that extra magical feeling, the best time to go would be in the morning and it’s especially enjoyable if it’s a bit foggy! Free to enter. If you want to make your own customized Private Van Tour + Guide, firstly pick where you want to explore, the West or East side of Jeju island (there is time for one side per day/9hrs car rental time) and write down all the famous sights and/or hidden places you want to go to. 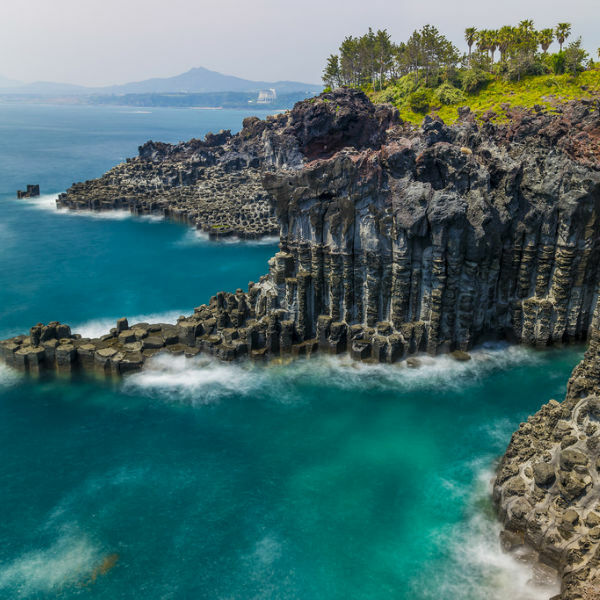 Check out this blog for more sights to choose from: Explore Jeju island west & East, and finally book by clicking here: Jeju Island Tour – Private van with Tour Guide (East or West). Choose Custom Itinerary and write down places you want to visit in the special request box. Second of all, public transportation does exist but it’s not that great and won’t save you a lot of time. Some people like to rent a scooter, which is fun but make sure to look up weather conditions and Summertime is not recommended for this if you can’t take the heat. The easiest, most comfortable AND affordable way to travel in a small group of 4~9 people is by a Private car Tour. Why? Because you get a driver who takes you anywhere you’d like within a 9h time limit, a Tour guide will guide you through the sights and prepare the best meal choices for you, you can customize your trip and add fun hidden places and lastly get picked up and dropped off at your hotel or anywhere you’d like in Jeju city! What is the difference between a Private Van Service and a Tour Guide Service? 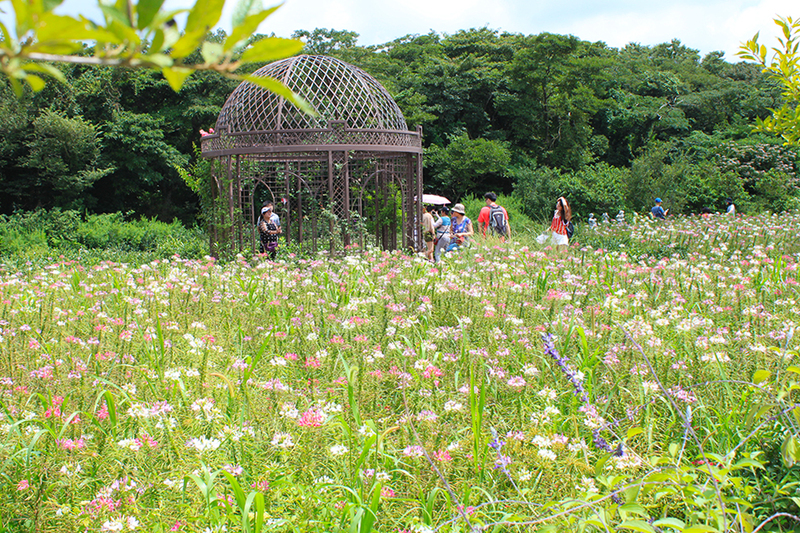 Want read about less famous/hidden places on Jeju island? 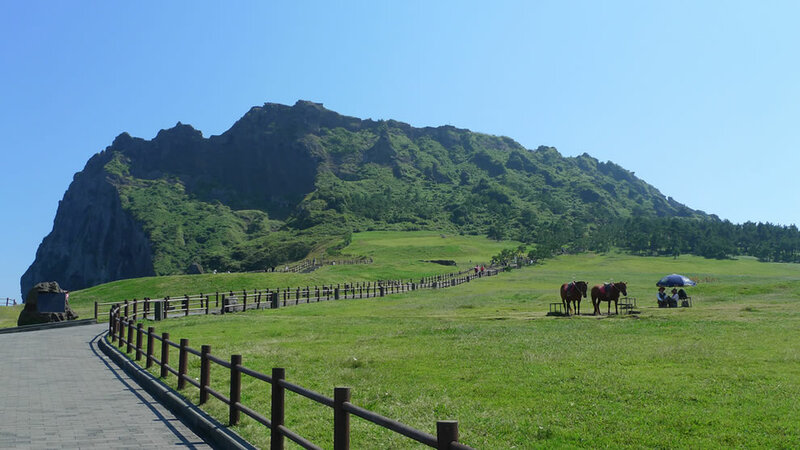 Top 3 must-do for your Jeju Island Tour! The mysterious Road or also known as the Goblin Road is famous for its optical illusion that makes objects appear to be rolling up the hill instead of moving downwards. Many tourists come after hearing reports of “possessed” cars, with their engines presumably turned off, somehow rolling upward. You can also try this on the spot or use a water bottle to see the water seemingly flowing upstream! 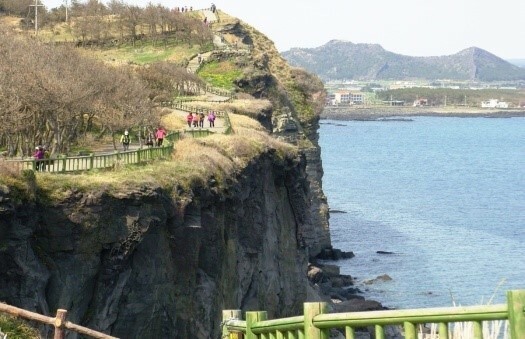 Jusangjeolli Cliff is a natural and beautiful cultural monument of Jeju Island. 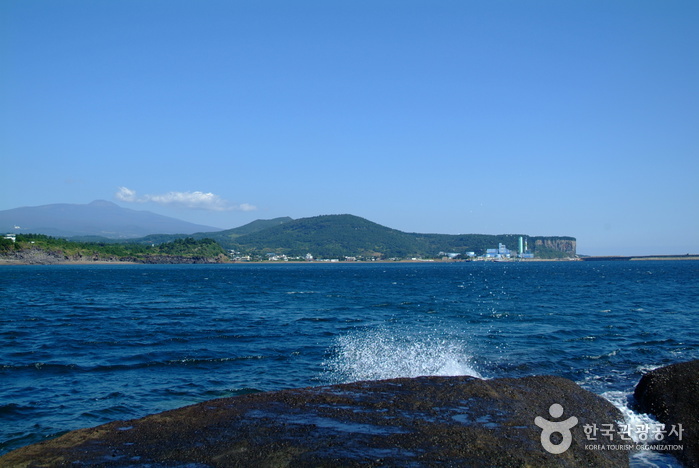 It was formed when the lava from Hallasan Mountain erupted into the sea of Jungmun. They are rock pillars shaped like cubes or hexagons of various sizes and almost seem as if stonemasons had carved them out. The waves of the high tide crashing into the side of the cliff gives a breathtaking view of the ocean surrounding the pillars. 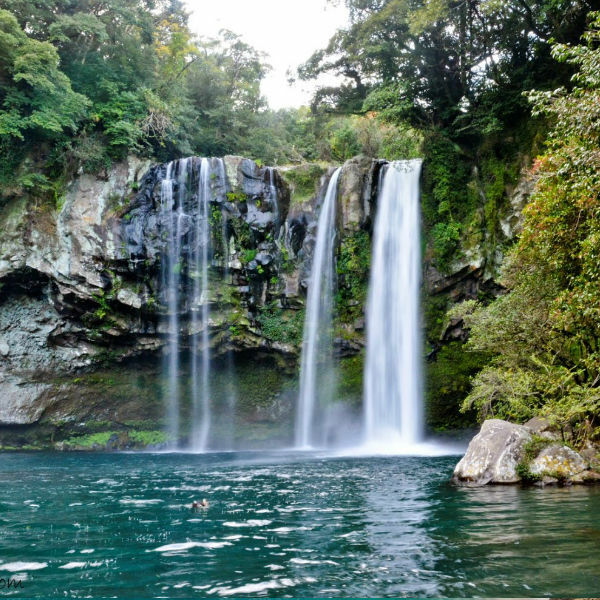 Cheonjeyeon Falls, named “The Pond of God,” is really a must see. It’s a very calming place with beautiful plants and clear blue water. Perfect photo and resting spot! Sanbangsan Mountain is the result of a great old volcanic activity making a huge lava dome. The cliffs are marked with interesting formations. 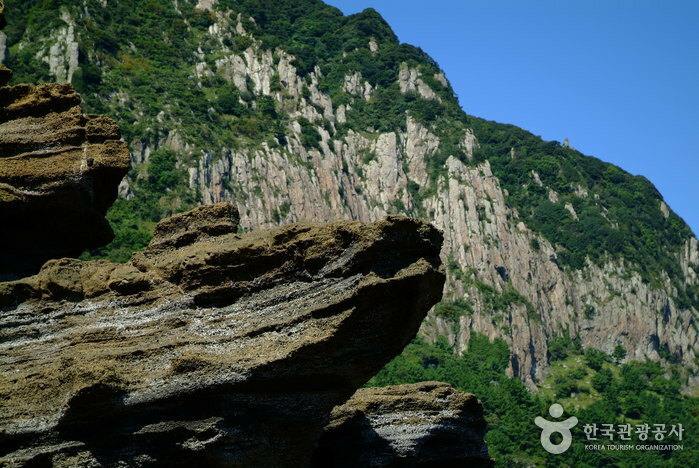 The name ‘sanbang’ – literally means ‘a cave inside a mountain’ – which suggests that this mountain contains a cave located about 150m above sea level and has a great view out over the ocean. You can often see clouds above the mountain due to being close to the ocean and its high elevation. On top of Sanbangsan lies 2 temples that hold relics of Buddha. 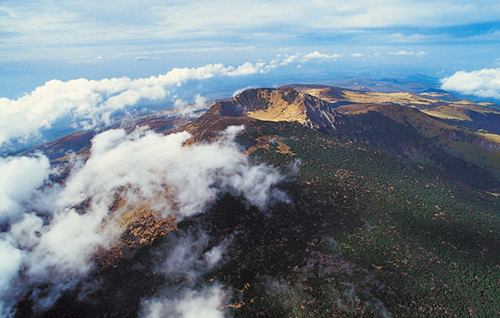 Songaksan Mountain is also called 99 Bong (99 Peaks) due to its 99 small peaks. The road from Sanbanggulsa Temple in Southern Jeju to Songaksan Mountain is a famous coastal drive with an amazing scenery. From the summit, one can see nearby islands such as Marado, Gapado, and Hyeongjeseom, and as far as Hallasan Mountain and the Pacific Ocean. If you Look along the coastline, you may also spot the large man-made caves built during the Japanese occupation. 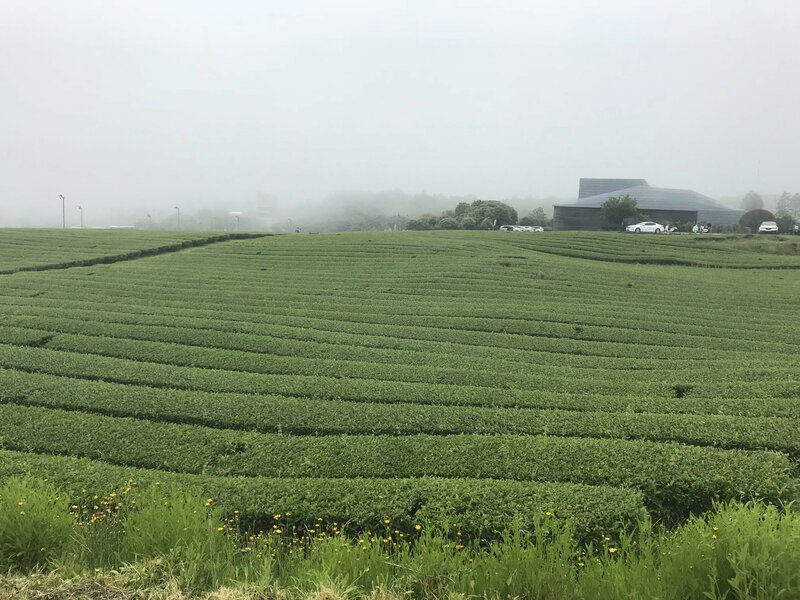 O’sulloc Tea Museum, right next to the famous green tea fields in Jeju, was the first tea museum opened in 2001 with the aim of introducing and spreading Korean teas and the traditional tea culture of Korea. The museum is a cultural space where the West and the East, and modernity and tradition coexist in harmony. 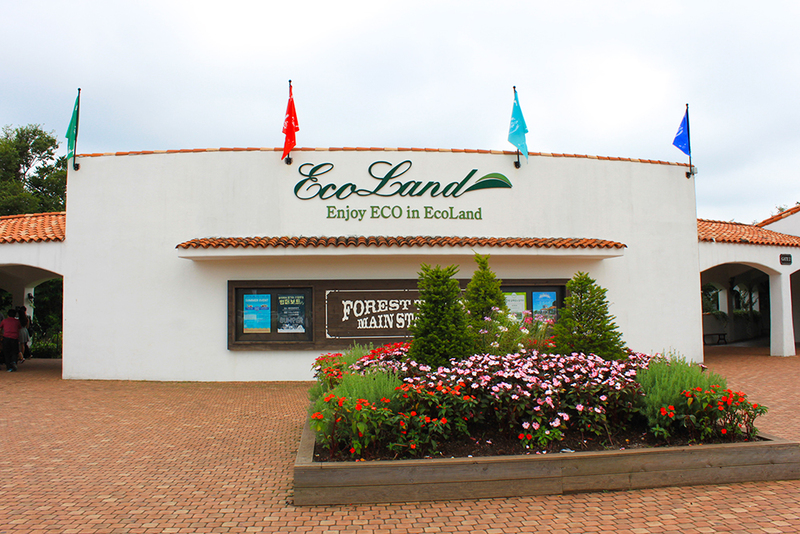 The museum has a tea gallery, eco-friendly resting area, and cafe where visitors can enjoy a variety of tasty tea-based desserts. 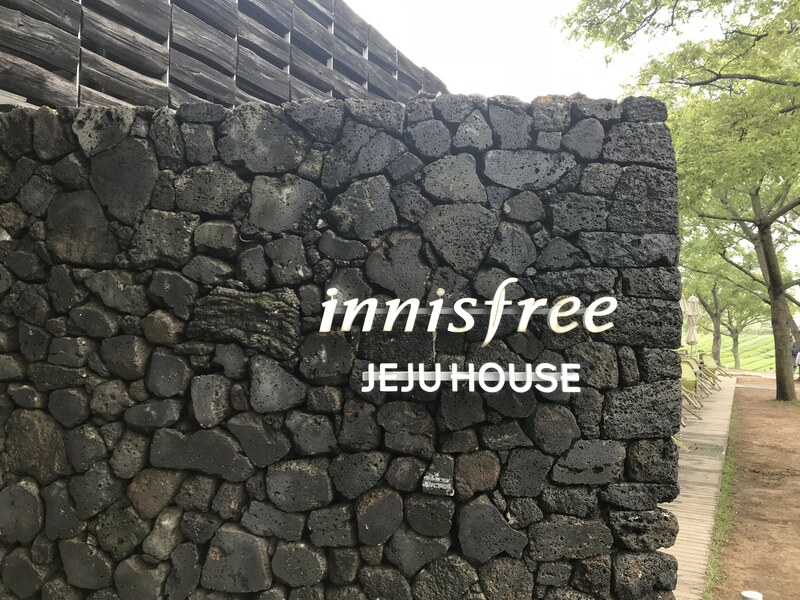 Innisfree is a natural cosmetics brand that makes its products with quality ingredients harvested from Jeju island. 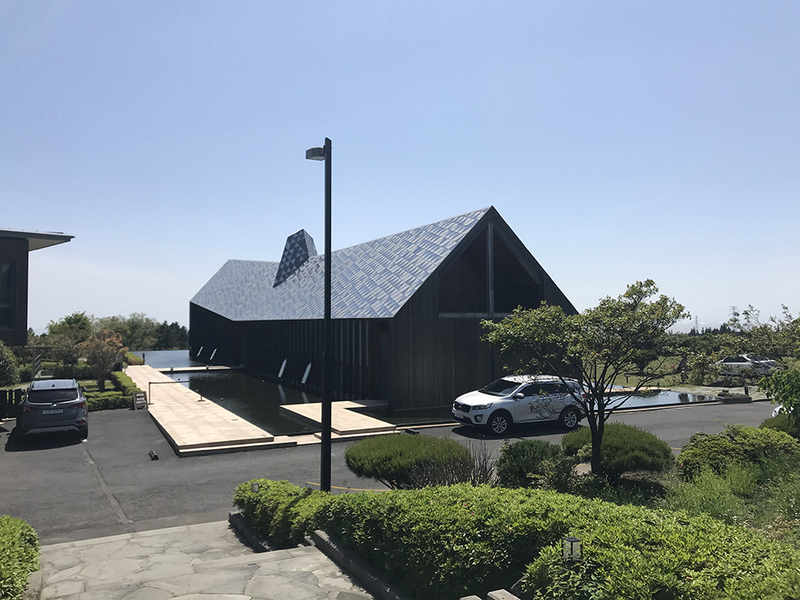 At Innisfree Jeju House, you can experience everything about Innisfree with a variety of activities that satisfy all five senses, as well as relaxing while surrounded by the beautiful nature on Jeju Island. Like this Day Trip? How to BOOK! 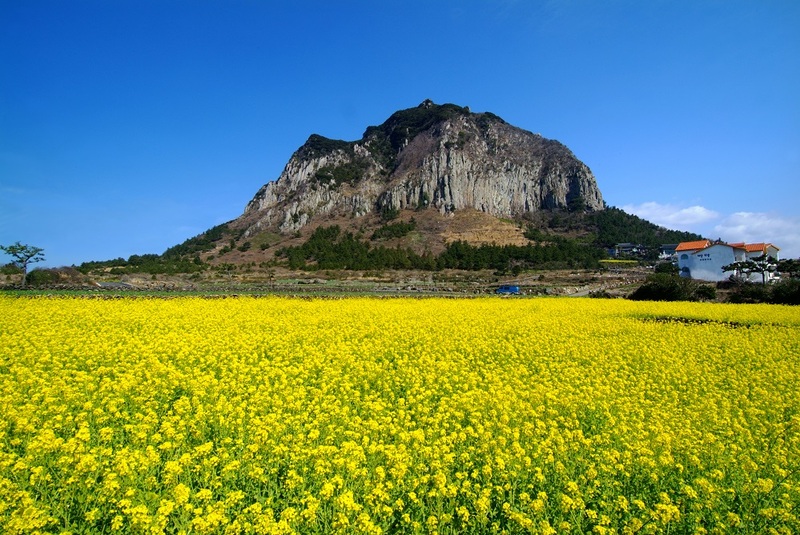 Hallasan Mountain is the highest mountain in South Korea and is perhaps the island’s most memorable landmarks. It takes an entire day to hike up so it’s definitely enough to enjoy Mt. Halla views and nature with a simple stop by, and take pictures of all the different kinds of plants and animals you may see. 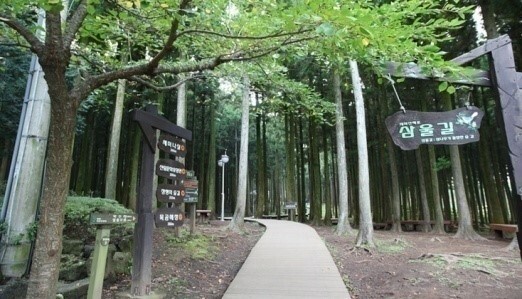 Jeolmul Oreum, the park’s main mountain, is famous for its beautiful Japanese cedar forest. This forest features a promenade, pond, observatory, and grass square. There are many trails to pick from, each with different length and level of difficulty. A very beautiful and peaceful, cooling place to relax at with a cup of coffee. 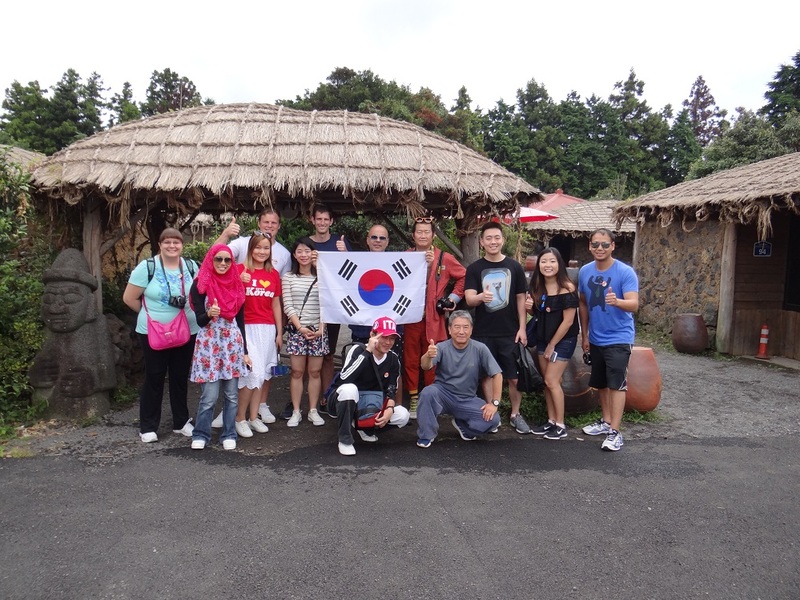 Seongeup Folk Village is a small traditional village that holds a lot of Jeju culture. There are still residents living here as well. 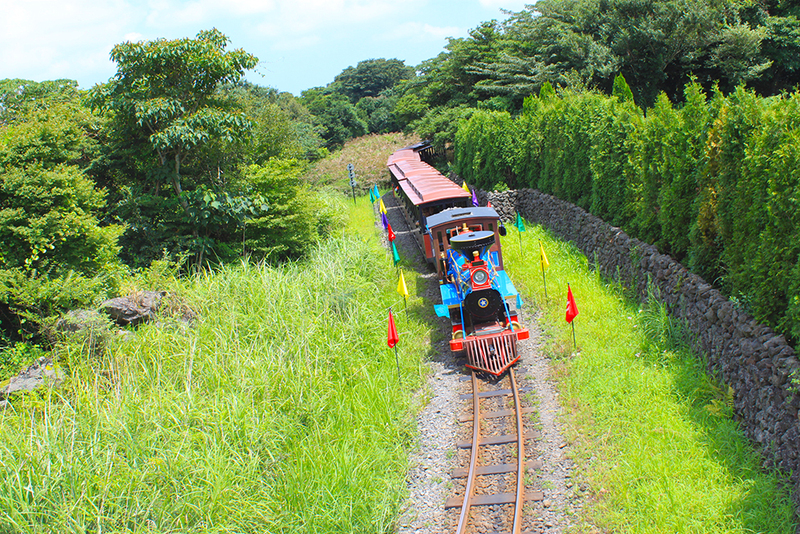 The black lava rock walls, the straight but curvy alleys to block the wind, and the stone grandfather statues (called Harubang), have become a prime feature of the landscape. The local black-haired pigs are especially well-known characteristics of Jeju folk culture. The Jeju black pork is said to be very nutritious and it’s very delicious! 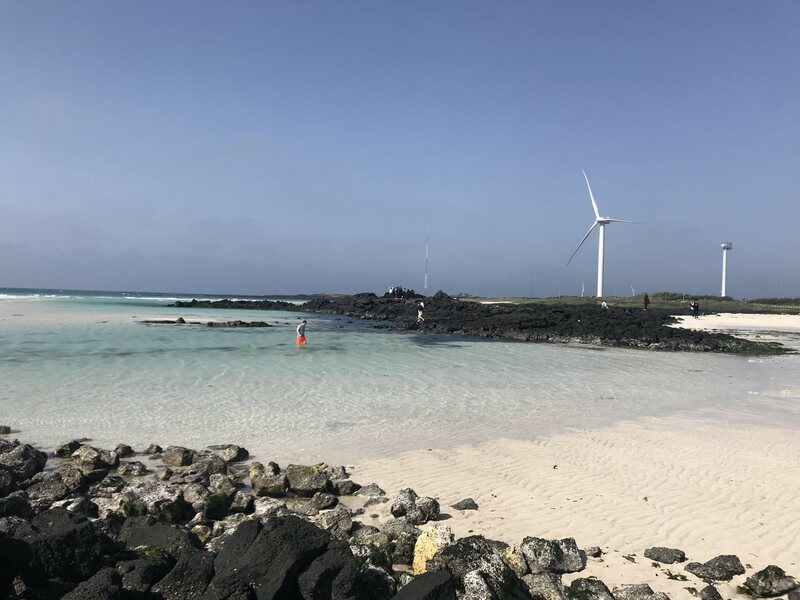 In the harsh Jeju environment where rice paddle is deemed too difficult to grow, the people of Jeju relied on fishing and trading their catch as a mean to provide for their family. Because Jeju men spent weeks on fishing boats without returning home women quickly took up the task to provide for their families. Now classified as a UNESCO Intangible Cultural Heritage of Humanity, see these amazing woman divers demonstrate their diving routine, you can even try the freshest sea harvest ranging from octopus, abalone, clams, squid and more as soon as the woman divers return from their demonstration! At the same place where the Woman divers perform their show lies Sunrise Peak! Take a small hike up the mountain and enjoy an amazing view! A Jeju favorite! 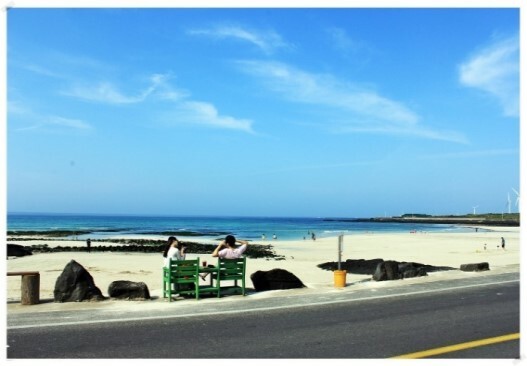 Woljeong Beach is famous for its scenery, white sand, and beautiful emerald ocean. Enjoy cozy and beautiful cafes along the streets near the beach. A great visit especially on a hot day! 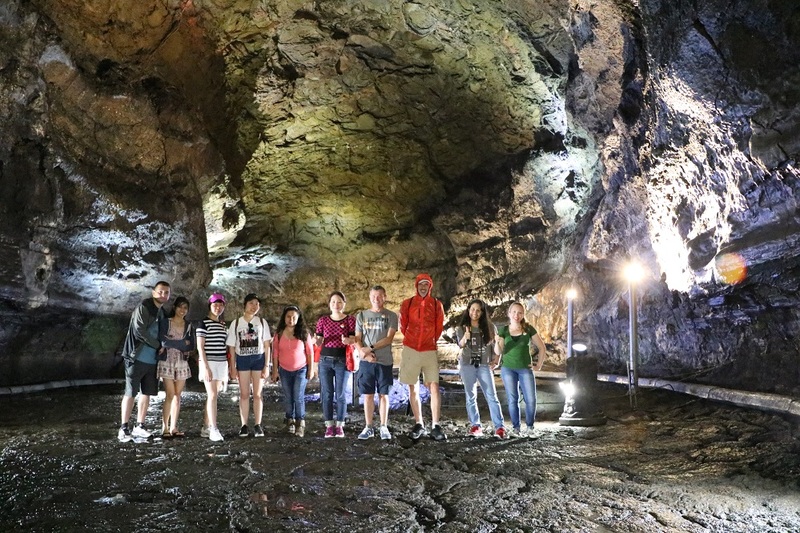 Go down and feel the cool air, be amazed by the natural lava tube tunnels and interesting structures inside! Only 1km of the 13,422m Manjanggul Cave is open to tourists, but that 1km is a really fun and interesting walk.